I'm looking forward to spending the next 3 days in Detroit for the "Go Further with Ford" conference. The conference will cover some interesting topics on everything from global trends and Ford the company itself. 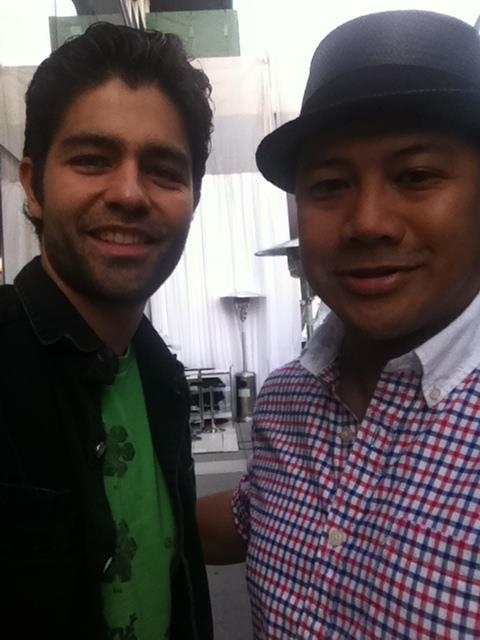 There will be many key speakers to be highlighted, most notable to me would be Adrian Grenier of Entourage fame. I hope to meet him again since I met him last year at TIFF festival in Toronto. I'm also looking forward to meeting some new faces and old ones from the North American Auto Show earlier this year in Detroit. I'm excited to test drive some FORD vehicles over the few days. Follow me on Twitter at @clickflickca and follow the hashtag at #GoFurther I want to "Thank" Ford Canada for giving me this unique opportunity to learn more about the company and brand through social media and experiencing it with other interesting people from all walks of life. Miss Vickie's Celebrates 25 years! When I first got the invite from Miss Vickie's to attend a soiree which involved wine and chips I was kind of confused to be honest. Usually when I have chips I have it with a glass of pop or ginger ale but that's just me. The invitation stated that it would be a wine and chip pairing. The winery being paired with the chips was from Rosemount Estate which is Australian. The event began with lots of canapes and hors d'oeuvres to tempt our taste buds. The event began shortly with an introduction from Meghan Merkler, Marketing Manager of Miss Vickie's and Andrew Floor, Global Brand Director from Rosemount Estate. Now it started to make sense why wine and chips are paired. Meghan had reports that state when women get-together they are looking for a cheap alternative and less time creating of food dishes. Most of us like to snack on chips. It's a cost-effective and cheaper option than the usual cheese and wine. Throughout the evening various stands had a sampling of different chips and wines. Some of the chip flavour were Jalepeno, Sweet Chilli & Sour Cream, Lime and Black Pepper, Balsamic Vinegar and Sweet Onion and Original Recipe and my favourite the Sea Salt & Malt Vinegar. These chips were paired with various Rosemount wines. I really enjoyed the Riesling with my favourite chip flavour. It was quite a mix of people from the wine/food industry to actors and entertainment folks attending the event. It was quite a fun event and a unique food and wine experience. Kudos to Pepsico and RoseMount Winery for "Thinking Outside the Box" with various pairings in a unique venue at the Arcadian Lofts. Congratulations to Miss Vickie's for 25 years. I can't even believe they have been in business for that long. Amazing. Can you believe it's June already? That means Father's Day is just around the corner. To be exact it's on June 17th. The folks at Conair have given me the opportunity to giveaway a Conair® i-Stubble™ Trimmer (GMT900C) to one of my followers on Twitter. I actually tried this Conair i-Stubble trimmer and enjoyed the simplicity of the unit. It's pretty easy to use just like an ordinary shaver. 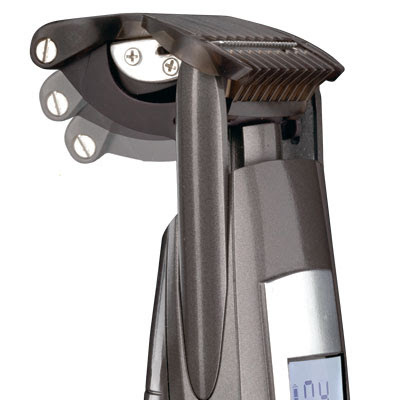 It has a digital LCD display and buttons to simply adjust the shave and height of your stubble which is cool. If you guys know how it feels to shave evenly throughout your face this solves it for you. It has a shave contour that adjust as you move it along your face. This unit basically can get you that perfect stubble for that perfect look. Look out ladies your man will look more handsome now because of this. To enter my Conair i-Stubble giveaway you must ENTER below via rafflecopter. Winner will be drawn on Thursday June 14, 2012. (Canadian residents only) Just tweet: "@clickflickca I want to win a Conair i-Stubble for dad. #iStubble" using the form below. a Rafflecopter giveaway Disclosure: This post is sponsored by Conair. I will receive compensation for this post but all opinions are my own. 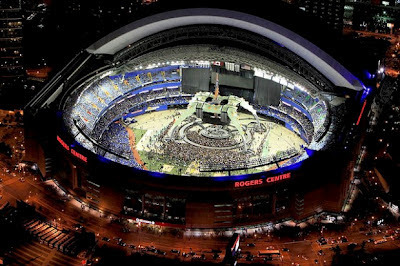 Join me at the Rogers Centre. The tour this Sunday June 10 will commence at 3pm and will be approximately 1 hour. It is complimentary and exclusive to my Twitter followers. Please make sure to wear comfortable shoes and we will meet at the north east side of the Rogers Centre near the base of the CN Tower. Make sure to bring your cameras and questions. I look forward to meeting you on Sunday! To register click below. Entripy is your source for Custom printed tshirts. Entripy is Canada's most trusted source for Custom printed t-shirts. I first heard of them via Twitter when they offered a "Tweet contest". The contest by @Entripy asked people to tweet Entripy and you could get a customizable t-shirt with your Twitter handle on it. I was selected as one of the lucky people to have won that day. Ever since then I've actually become a customer. Why? Because I've engaged and talked with them on Twitter about everything besides t-shirts. We would talk about basketball or just everyday generic things in life. 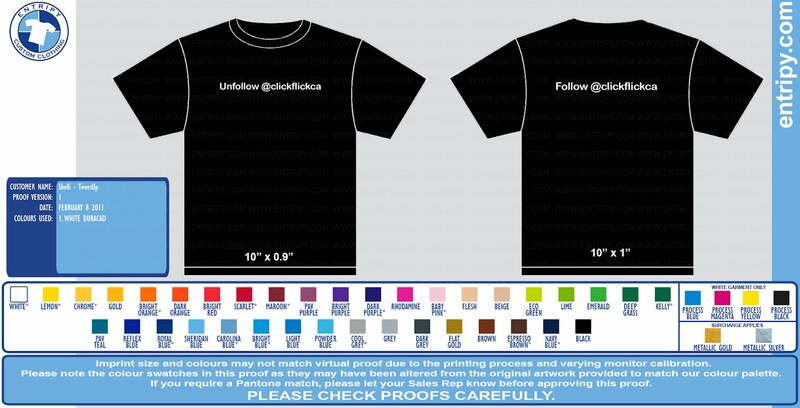 When I had to place an order for my free Twitter handle t-shirt the process was so easy. Every year I organize an event called RegiftTO. It's a big gift exchange between Twitter friends just after Christmas. It's like a big Kris Kringle for Twitter. I wanted a way to for guest(s) to leave with their gifts intact and Entripy donated tote bags with our logos printed on it. This was a nice an unexpected gesture. They have now become one of my signature sponsors for RegiftTO every year. It's important to note that I've never met anyone from Entripy. I've only dealt with them via Twitter and email. This is why it was great to share this video because it give me some validation of the persona of the company. They seem like a cool bunch that do innovative things with Social Media. I've ordered custom bags for my own personal use and also my own "ClickFlick.ca" jacket. I co-found http://www.devto.ca and we have our DevTO giveaway t-shirts made by Entripy. If you are looking for a custom t-shirt company you should give them a call. The complete process from start to finish is easy to order with them. You will get an instant quote and details of your order in a prompt manner.